At the Rare Book Finder website, they list top of the market (price wise) Ebay books. It's a useful site if you just want to see the rare and classy stuff, but books with ridiculous price expectations creep in. Last week a guy wanted a starting bid of $30,000 for a cloth bound set of Thackery (sic) probably worth no more than £50 ($100). He was very jazzed about the dedicatory preface by Thackeray which he showed in a picture, merely a printed page without even a facsimile signature. You could get a limpid 30 volume full leather set with ornate inner dentelles, watered silk endpapers, loosely inserted letters, drawings and even substantive manuscript material for $30K. Instead you get a late Victorian reprinted cloth set that most dealers would attempt to leave behind if they bought a lot of books with them in it. The seller appears to have withdawn the items possibly after flabbergasted emails. I nearly sent one myself but there is very little satisfaction in informing a fool that he is a fool. 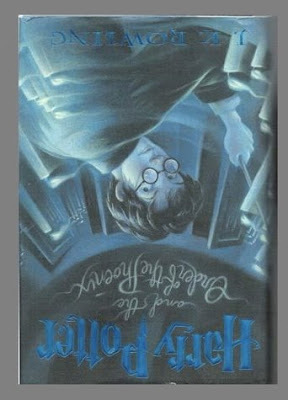 Almost as silly is the chap who wants $25000 for a late Harry Potter printed upside down. I know that some Harry Potter collectors are lunatics, bedlamites, bereft of reason, 'away with the fairies' and mad as march hares but none are so deluded as to even pay a fiftieth of this price (surely?) The traditional wisdom is that misprinted books, unless they establish some kind of precedence, are basically defective and thus without value and to be thrown in the eco bin. However self generated dealers and collectors on Ebay seem to have established a new market, possibly influenced by stamp collecting where faults count. Many sellers have tried to sell defective Potters, occasionally with some success--usually only $30 or $40 but there is talk of some chancer once getting $400. Person A. Ok, i went out to my local store and was browsing the books. i picked up an edition of harry potter and the order of the phoenix, i opened it and it didnt have a chapeter one or even the front page with the copyright thing. it starts with page 721 to page 786, after that it continues with page 68 onwards untill the end. Person C. Sell it on Ebay for bajillions. Person A. Do you think its worth something? Person C. E-Bay it. I bet you'll get between $20,000-$30,000 for it. Person D. If its a misprint then it could be worth A LOT. These types of mistakes are sometimes very rare. If you think it is a legit thing and real misprint, well lucky you. But I wouldn't ebay it until you find out how much it is worth. Person F. I was working on a job in Tesco's the other day and they had one in the returns pile which was mis-printed but I thought it wasn't worth picking up. Person C. There there my friend. Poor you lol. Missed out on millions, man..
Harry Potter and the Order of the Phoenix. Very Rare Book! This is a brand new book never taken out of the bag except to discover the ERROR! So it is in Perfect Shape! This book is completely printed UPSIDE down, every page! How is that for a mysterious fact for a mysterious book! I have been looking and have never seen that as an error. I have seen some of the silly errors people report, but to me this is the best. ... I have 100% rating and this is all truthful... We will require insurance with the sale. I've got one too! I'm rich! No, wait, I've just got it turned upside down. About the stamp comparison: there is at least one counter-example to be found with the Tintin book (Belgian-French edition) L'Oreille Cassée where the "Blue Foliage" first, known as such because the leaves on the upper part of the cover have been mistakenly printed in blue instead of green, has got higher market value than the ordinary one. Also the mispelled first name of illustrator Marc Simont (Mark) on Thurber's 13 Clocks first appears to be a value-adding fault. Excellent posting. Too True, Too True! I'm reminded of the first edition, first printing of Elmer Gantry. The spine had Elmer Cantry and it was in a font that the C and G looked quite similar. - The later volumes could be considered a 'dog' and I've seen eBayer's trying to pass off (intentionally or not I don't know) the latter for the former. I have had several people return books that had been "printed upside down." Often if you can ask them to turn around for a quick second, you can flip the dust jacket around and have a fresh copy. I have the Book, Gone With The Wind, Copyright MCMXXXVI, By The McMillian Company, Printed U.S, To J.R.M. I do not write the jargon used to describe the book, so here goes: The pages are all perfect! Some yellowing at the edges. Call it toning I guess. Bunding: The Spine is perfect!Slight corner bumping. Slight wear. Id the top title of every page was printed right side up but the actual book printing was upside down that might be one thing. I would have to look at this listing to see if there are a lot of pictures. because if you don't have a lot of copies where the page number is rightside up but the writing is upside down then it might be worth something. Anyways I came to this page to see if the first edition of this book from the u.K is worth anything. does anyone know about that? and I have someone looking to sell a june 26th 1997 of the first book, but it says 1/39. from my understanding there were only 1000 books printed of harry potter in June 97 europe edition. I have a third edition of Gone With the Wind with the signature of Ruth A. Carr. Does anyone know who this might be and the best method of selling this book. It has no dust cover; also, let me know its value. It's in good condition with a few spots of discoloration on the page before the actual title page. I have a second edition on "Gone Withe The Wind" printed in June 1936, it has a little bit of wear on it and no dust jacket. What is the possible value of this book? You can contact me at georgecreel2000@gmail.com, thanks.